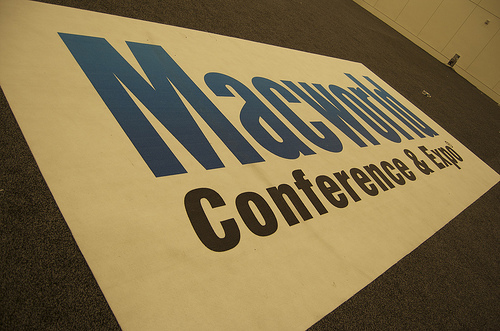 This is a continuation of Macworld Keynote Part I, Part I and, Macworld Registration Part I and Part II. Immediately after the keynote was over, I hung around Moscone West and actually got to see Steve Jobs a little bit closer. Sidney was in Moscone South but they were not letting people onto the floor yet. After about 5 minutes of hanging around with Jobs and the media, I decided to join Sidney so we could get our hands on the new products (and livecast for The Digital Lifestyle). I ended up arriving just in time and was among the first to lay hands on the MacBook Air’s. After spending about 30 minutes at the Apple booth, we moved on to the other parts of the show floor. Slowly, however, we began to feel the effects of limited sleep over the past night and decided to head back to our hotel room at about 4PM. When we woke up that next morning, we started to upload all the content from the keynote and show floor. Afterwards, we ate breakfast and hit Moscone West. For those not familiar how Macworld Expo is run, they split the show floor into 2 buildings. This year, it happened to be Moscone West and South- typically it is North and South. Moscone South is filled with the booths from the large companies such as Microsoft, Google, Apple, Adobe, Griffin, Belkin and more. Moscone West had some of the smaller vendors, and gets much less traffic and attention. Knowing we lost time in the morning, we figured that we could tackle the West Hall that day. We carefully walked down each of the isles, talking with each of the exhibitors. Seeing anything interesting or funny, we would instantly start recording. Among my favorites were McAffe, who had a booth with only one person in it, preaching about Anti-Virus software for the Mac, yet counting Mac viruses dating back to OS 6 (we have an interview coming soon). We also met some really interesting people as well- a guy who converts Mac Minis to be Military Grade (VictorSystems) or the Remote Time Machine (MiraLink) people. As always, there was an endless count of iPod accessory makers which quickly got repetitive. The West hall was a lot calmer and had a more intimate vibe than the bustling South Hall. 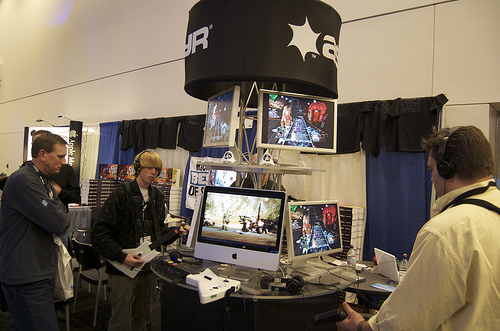 Buried amongst the loads of iPod accessory makers were some great smaller vendors: Ambrosia Software, Aspyr, Polar Bear Farm to name a few. Before we knew it, 6 o’clock came around and we had to leave. Part II coming tomorrow but for now, check out the EXPO video or the two interviews (Ecamm Network or MacSpeech) from the show floor. 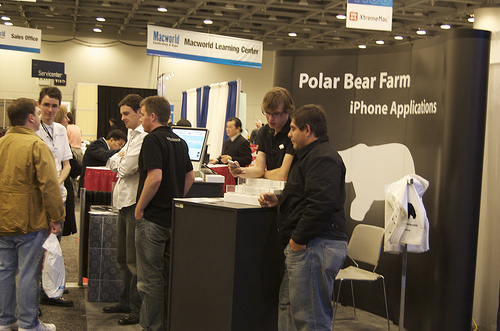 The Polar Bear Farm booth.